When autumn arrives, grocers start to feature colorful, thick-skinned winter squash. Their variety seems endless: hubbard, acorn, kabocha, butternut, turban. And of course pumpkin (a name many people use generically for winter squash, though here in the US, “pumpkin” refers specifically to the big orange-hued squash that we use to make Jack-o’-lanterns—and pie). You can often use the various types of winter squash interchangeably. Although their flavors and textures may differ somewhat, they all bear a close family resemblance. Certainly all of them work in a dish like this savory gratin, where the deep flavor of squash combines well with sharp Gruyère cheese. This dish is almost a meal in itself, but it also makes a terrific side for roast fowl or baked ham. So it’s a handy recipe to have on hand when you start planning Thanksgiving and Christmas menus. But you might want to prepare this dish right away—just to test it out, you know. You’ll be glad you did, because the flavor is wonderful. And you can pat yourself on the back for planning ahead. I typically make this dish with acorn squash, but you can substitute another variety if you prefer. I think butternut, buttercup, or hubbard would probably all be delicious. All gratins are more or less the same: You combine the main ingredient (squash, in this case) with cheese and cream or a Béchamel (white) sauce. This recipe is one I (lightly) adapted from James Peterson’s Vegetables. It makes enough to fill a gratin dish that holds about 7 cups and measures 8 x 11 inches (13 inches with handles). Roasting the squash takes a hour, and can be done a day or two ahead. Prep time for the gratin itself is 15 minutes or so, and the dish takes 45 minutes or more to bake. So plan on at least 2 hours total (most of it unattended). Leftovers keep for a few days if refrigerated in an airtight container. They’re good cold, but better when warmed in the microwave. If using acorn squash (my preference), cut the squash in half at the equator. Scoop out the seeds and the pulp that surrounds them. Place the squash halves flesh-side down in a rimmed dish just large enough to hold the squash. (If using another type of squash, you may need to cut it into wedges; scoop out and discard the seeds, and place the squash flesh-side down on the baking dish.) Add about a quarter inch or so of hot water to the dish (just enough to barely come up the sides of the squash pieces) and cover with aluminum foil. Place the baking dish in the oven and set the timer for 50 minutes. The squash is done when its flesh is soft—test by poking a paring knife through the aluminum foil and rind into the flesh of the squash. If there’s resistance from the flesh, cook a bit longer. I usually need to cook the squash for an hour, but you don’t want to overcook, so start testing at 50 minutes. Let the squash cool, then peel the skin off (with acorn squash, I can usually just pull it right off) or scoop the squash flesh out of the shell. Roughly chop the squash flesh into dice of ½ to ¾ inch. You can use the roast squash immediately in the recipe, or refrigerate it in an airtight container for up to 2 days before proceeding with the rest of the recipe. Peel and thinly slice the onion. Peel and mince or thinly slice the garlic. Heat a frying pan, preferably nonstick, on medium stovetop heat. When heated, add the olive oil. When the oil is hot (maybe 15 seconds—it will shimmer), add the onion and garlic. Season with salt and thyme, and sauté until the onion is translucent (roughly 8 minutes). Meanwhile, butter the gratin dish (I’m not sure this is strictly necessary, but I like to do it). Grate the Gruyère and Parmesan cheese. When the onion is ready, spread about half the onion-and-garlic mixture on the bottom of the gratin dish. Spread about half the roast squash chunks over the onion/garlic mixture, making an even layer. Add a few grinds of black pepper and about half the Gruyère cheese. Cover this with the rest of the onion/garlic mixture and the rest of the squash. Add more black pepper and the rest of the Gruyère cheese. Pour the heavy cream over the top, and sprinkle the Parmesan cheese on top of that. Place the gratin dish in the oven (I usually put a rimmed baking sheet on the rack below the gratin dish in case there’s spillage) and set the timer for 35 minutes. When the timer goes off at the 35-minute mark, check to see how the gratin is coming along. If you see liquid cream sloshing around when you tilt the gratin dish, it’s not done yet. Keeping baking, checking every 5 minutes or so. This gratin usually takes 45 minutes to bake in my oven, but I’ve had it take longer. When done, the top should be golden brown. If not, run it under the broiler for a minute or two to brown the cheese. Sprinkle with parsley as a garnish, and serve. As mentioned, almost any kind of winter squash should work in this dish. Acorn squash has a particularly sweet flavor, so that’s what we tend to use. Exact quantities aren’t critical for the squash. You want about 2 pounds of cooked squash, so start with 2½ pounds or so of uncooked squash. Remember, you’ll be discarding the seeds and skin. For the dish shown in the photos, I used 28 ounces of cooked squash—i.e., a pound and ¾. You can substitute another hard Swiss cheese for the Gruyère, if you wish. Make sure it's one that melts well. I generally add salt to season the onions as they sauté (Step 3 of the assembly procedure). How much to use? I’ve suggested an amount, but you really need to rely on your own taste. Cheese adds additional saltiness to this dish, so I suggest erring on the side of too little rather than too much. It’s easy enough to add more salt (and pepper) at table. Cream makes a very satisfying gratin, IMO—but it also adds calories and fat. You can substitute milk if you prefer (though if you use skim, the flavor will suffer). We tend to think of squash as vegetables. Technically, however, they’re fruits (because they contain seeds). The seeds in winter squash (with the exception of a few, like pumpkin) are generally inedible, as are the skins on all winter squash; thus the need to peel the skin before using. The skins and seeds of all summer squash are usually edible. Squash originated in the Americas, though many varieties are now grown around the world. “Because the Cards are going to squash the Red Sox!” said Mrs K R.
A man after my own heart...just roasted some spaghetti squash yesterday; now off to do something with it! This looks yummy (I can use that word if I want to!). I love the heartiness of this gratin, it's absolute fall perfection. Wonderful recipe, John! Hi Kiran, the topping tastes even better than it looks! Thanks for the comment. Hi Barb, you can use any word you want! ;-) I'm always roasting squash, then figuring out what to do with it! Thanks for the comment. Hi Gintare, isn't this a nice dish? Loads of flavor! Thanks for the comment. Hi Jeanne, you have to watch out for those cheese elves! We actually did eat this as a meal - it was so good! Thanks for the comment. What a great dish for these chilly days...I love gratins and would love to try this one with squash. I'm not keen on squash but this does look good! Oh yum -- I just stocked up on a ton of winter squash between my father-in-law's garden and the last day of our farmers' market yesterday. I love to make spaghetti squash gratin, but need to try it with one of these other ones. Hi John , what a delicious dish , love all squash , I will definitely be using cream :D , this is the season you can get away with a few extra pounds , I think I will use this dish at a brunch , thanks so much for sharing :). Hi Denise, isn't this nice? I do so love the flavor of winter squash! Thanks for the comment. Hi Caroline, actually you could probably substitute a lot of different veggies for the squash - cauliflower, in particular, would be nice (might want to make a white sauce for that, though). Thanks for the comment. Hi John ... Congrats on your win at the Pasta Party . Hi Amy, all squash is pretty good, isn't it? Glad you scored such a haul! Thanks for the comment. Hi Nee, we tend to be rather enthusiastic eater at this time of the year, too. ;-) Thanks for the comment. This looks very, very good. I love squash and squashing. Hope your team wins! But everyone will win by making this. It looks delectable! Interesting game ending last night (in our favor) - YAY! :) Your gratin is a very creative and unusual gratin. I love it that you used acorn squash because I never know what to do with those little beauties other than just roasting them, but I'm not really a fan of them just roasted. However, the combination of the Gruyère cheese and acorn squash sounds wonderful. Thanks for sharing this dish! Hi Abbe, I hope the Cards win too! Boston has a great team, though, so it'll be tough. And everyone will indeed win if they make this. ;-) Thanks for the comment. Hi MJ, that ending was amazing, wasn't it? I've re-watched it a good half dozen times - I've never seen anything like that! This recipe really has a ton of flavor, and I think acorn squash is wonderful in it. Thanks for the comment. 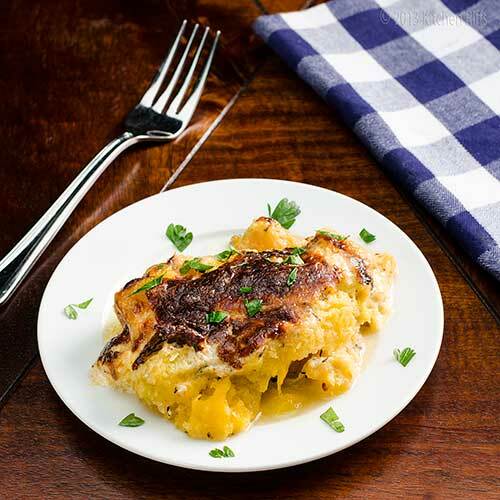 Hi Uru, you need this gratin to give you strength to help you with your studying for your last exam! ;-) Thanks for the comment. We're rooting for the Cardinals, too! And your cheesy squash gratin looks amazing! I LOVE your squash gratin! I could eat the whole thing. so unique. never made anything squash, loving the thyme in this recipe, so earthy!!! Hi Charlie, the naming confusion is kinda fun though, isn't it? ;-) And I, too, am all for recipes where you can do much of the prep ahead! Thanks for the comment. Hi Carolyn, this certainly is satisfying enough for a meal! ;-) Thanks for the comment. Hi Liz, go Cards! ;-) Thanks for the comment. Hi Maureen, true re the salt (in my experience) plus it's great to build the salt into the dish early - I find I don't need as much (might be my imagination, though). Thanks for the comment. Hi Honey, doesn't thyme have such nice flavor? And it goes so well in this dish! Thanks for the comment. My mom and I are sitting down to plan out our Thanksgiving meal this week...I can't wait to share this with her. What a beautiful and delicious way to enjoy winter squash! Hi Monet, I think you'd really enjoy this! Totally delish. Thanks for the comment. It's the time of year. I just roasted a Delicata squash for dinner and have a butternut and acorn waiting in the wings. 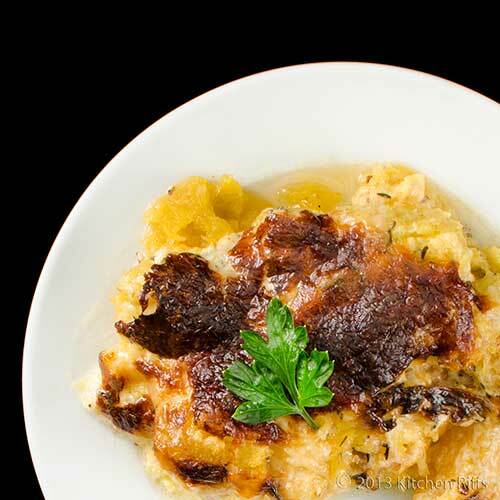 Never thought to make a gratin with squash, John, and this dish sounds wonderful. This would make a great Thanksgiving dish and the cheese might even entice the anti-squash types -- and there's always one -- to give it it a try. Thanks for sharing a new twist on an old favorite. Fantastic idea and post! I just prepared my first winter squash recipe, last week. This will be my second! Thank you for sharing. This looks delicious. It reminds me of a dish my sister makes with yellow squash in the summer. It is one of my favorite meatless entrees. I can't wait to try this recipe. I may just have found a new favorite. I too am behind the Cardinals even though we have a slight history. In 2005 when our beloved Astros played the Cards in the playoffs, I managed to somehow score tickets for game 5 for me, my daughter and my 11 year old son. We flew from Denver to Houston to watch the game and boy was it a good one. Just as we were ready to celebrate our win Albert Pujols hit a grand slam home run in the top of the 9th, ultimating beating us by one run. I'll never forget watching him run those bases. We still haven't quite recovered, even all these years later, but out of respect for a great team, we cheer them on. Hi John, I love gratins, and will make almost anything into one! Great way to use leftovers. And you're right there's always one in every crowd who doesn't think they like squash. I'll bet this dish will change the minds of most of them. Thanks for the comment. Hi Dan, this is totally delish! You'll like it. ;-) Thanks for the comment. Hi Karen, it's so weird the way sports teams can break our hearts, isn't it? Anyway, this is a lovely dish - a real keeper, IMO. Thanks for the comment. Gruyère, Parmesan, cream ... Oh my yes! This would be a great holiday dish. And GO CARDS! Hi Judy, ;-) This dish really does have so much going for it, doesn't it? Thanks for the comment. The topping is utterly delicious looking. Looks so comforting. I can imagine making a meal out of this! It looks very comforting. I've also never seen squash used this way. might be good as a base for mac and squash and cheese, too! Hi Dedy, this really is a comforting dish! Thanks for the comment. Hi Asha, it's really a great tasting dish. Kinda pretty, too. ;-) Thanks for the comment. Hi Cquek, you'll like it, I'm sure! Thanks for the comment. Hi Laura, it really is filling enough to make a meal! Ask me how I know. ;-) Thanks for the comment. Hi Beth, Go Cards! ;-) Thanks for the comment. Hi Faith, that's a really terrific idea - something I'll definitely try! Thanks for that, and for commenting. Another new one on me, John... I've made potato gratin plenty of time, but not with squash (or pumpkin). Love this... I can imagine the roasted browned topping is delicious. Hi Lizzy, this is such a nice change from a potato gratin! And yes, the browned topping is wonderful. ;-) Thanks for the comment. Just this morning I decided it was time to plan my Thanksgiving dinner. Marion and I usually have quiet holidays but it seems this year we are going to have a houseful! 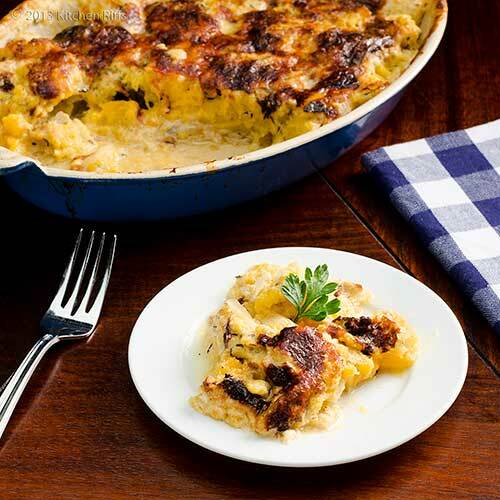 Lucky for me, after checking previous Thanksgiving meals and guest's like and dislikes, Winter Squash Gratin will be added to the list of Likes! Hi Louise, glad winter squash makes the Like list for your houseful! This gratin is a great recipe. Thanks for the comment. Ooooh, this looks so good! The best way to eat squash I think. Cream and bechamel sauces go so well with winter squash. This really would be great for Thanksgiving. Good luck to the Cards, I don't care for the Red Sox, though they seem to be leading right now. Heh--I don't follow sports, but Mrs. K R sure knows her stuff! By the by, was this delicious dinner for you two or a nice gathering? Looks delicious and comforting either way! I could definitely see serving this instead of sweet potato casserole that everyone insists on each year. I've got family coming in from all over this year which always makes it challenging trying to please everyone's palate. Who wouldn't love this though. It sounds fantastic! Leave it to James Peterson to come up with this- he always has superb dishes. Thanks for sharing. Gratins are a perfect dish for this time of year. I've never made one with winter squash and it looks amazing! I'm always looking for new things to try for holiday meals and I might have to add this to my Thanksgiving menu! Thanks for another great recipe, John! Hi Nazneen, I think the Red Sox are going to win it, alas. But they have a good team and are deserving. Been a fun series so far! And this really is a nice Thanksgiving dish. Thanks for the comment. Hi Ala, Mrs K R does indeed know her stuff! We ended up eating this for a weeknight dinner, then had the leftovers with another couple of meals later (it also makes a great breakfast, I found!). Thanks for the comment. Hi Vicki, this isn't so far off from a sweet potato casserole, although without marshmallows, of course! James Peterson is good, isn't he? He's a great cookbook author. Thanks for the comment. Hi Bill, I love gratins! They always look nice, and when you add loads of cheese, who can resist? Thanks for the comment. Hi Anne, it does indeed look like the Cards are the squashees rather than the squashers. ;-) This is such a good dish - really worth trying. Thanks for the comment. Go cardinals!!! I hate the red sox!! Hopefully they bring it tomorrow and start winning some games again! LOL Love the squash recipe! Love this gratin, John! I have a huge box of beautiful winter squash right now and I'd love to make this yummy dish - so warm and comforting. I look forward to your chowder (especially since I'm a Boston girl - I hope we can still be friends!). Hi Ashley, Go Cards! ;-) I'm not so sure they'll be able to come back, alas. Anyway, isn't this a nice recipe? Thanks for the comment. Hi Hannah, of course we can still be friends! And I do suspect your Red Sox are going to win the series. Anyway, this recipe is a real keeper - terrific flavor. Thanks for the comment. Hi Sowmya, isn't this nice? I agree it's so comforting! Thanks for the comment. This gratin sounds delicious. My neighbor gave us a couple of acorn squash and I wasn't quite sure what to make with them, so I will have to try this. Thanks for sharing. Hi Dawn, I really like acorn squash - loads of flavor. And wonderful in this dish. Thanks for the comment. Hi Yi, isn't this a great way to use squash? Glad you enjoyed the post, and thanks for the comment. Hearty dish indeed John. This looks wonderful and delicious. Thanks for the recipe! Hi Anne, it's such a tasty recipe! I love it. ;-) Thanks for the comment. Hi Easyfoodsmith, there's something about browned cheese mixed with cream that looks so nice in a picture! Thanks for the comment. The gratin looks very tempting. Loved the brown crusty top and the creamy inside. Great way to serve squash to kids. Will definitely try this. Hi Shibi, this really is a nice dish. And I love a crusty top! Thanks for the comment. Comforting, warming and scrumptious! A wonderful gratin. That last sentence closes it so well! Gratin was one of my mother's middle names growing up, and in a way she was right, food get a little bit better with a bubbly top. Looks so good! Hi Rosa, aren't gratins so nice? Very comforting, as you say. Thanks for the comment. Hi Paula, long live bubbly tops! Thanks for the comment. Hi Terra, squash makes a most excellent gratin! Really good. ;-) Thanks for the comment. Hi Irina, it's a great dish! Thanks for those very kind words, and for taking time to comment. Excelente plato salado solo he ocupado esta calabaza (alcayota) en recetas dulces buena sugerencia,abrazos y saludos desde Chile. Hi Rosita, welcome! We do a lot of sweet dishes with pumpkin and winter squash, but really like the savory ones too! So much flavor! Thanks for the comment. Hi May I have that recipe, isn't this a nice dish? Terrific flavor! Thanks for the comment. 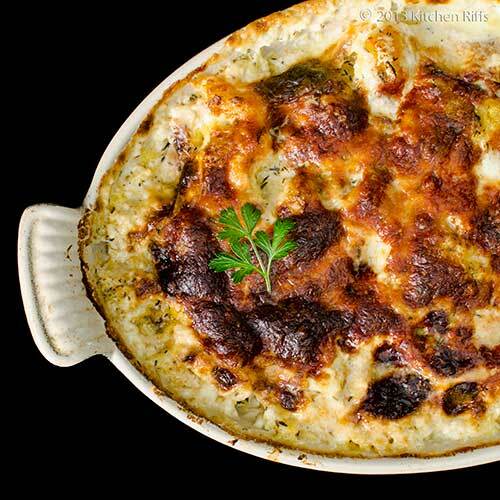 What a lovely gratin dish...I adore warm dishes on cold days! Hi Kristi, gratins are wonderful when the weather is cold! So comforting. ;-) Thanks for the comment. Hi Nami, if you love gratins, you'll swoon over this! It's truly good. But how can anything with all that cheese not be good? ;-) Thanks for the comment. John, your gratin looks magnificent! At some point while everyone is together over Christmas, we often make a big baked ham alongside a standard potato gratin. I love the comfort food-ness of that one, but i feel like this one may be making an appearance instead this year, as i have quite a bit of love for winter squash of all types. Hi Shannon, this would be outstanding served with ham! Really a great combo of flavors - I think you'll love it. Thanks for the comment.